making Wi-Fi and even devices freely available, etc. Some even support platforms for self-publishing. 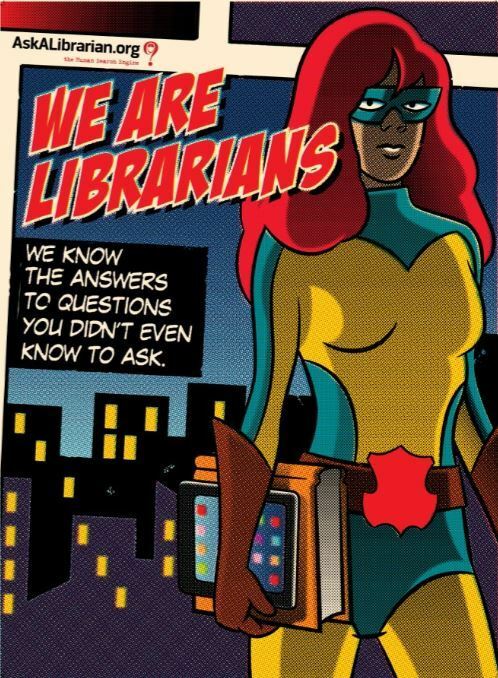 especially true for reference librarians. such as Florida’s Ask A Librarian. clearly impossible and no library can do the job adequately all alone. collaborated, each person specializing in some – but not all – subjects. would be available to patrons everywhere in the country. ago wrote an article whose message was clear “Advancing From Kumbaya to Radical Collaboration: Redefining the Future Research Library”. While his focus was on research libraries, his call for radical collaboration should be heard by all libraries. Certainly, all libraries – networked together – can do the same thing for the residents of their communities. The fifth annual worldwide virtual conference about the future of libraries in the digital age, Library 2.0, is being held today. I just completed my keynote presentation. Too often, discussions about libraries focus on how technological and economic trends are assaulting them. Economy And Government Provide New Opportunities For Libraries”. and society in our knowledge-based economy. Libraries: No Future Or Leading The Future? So from the relatively early days of the Internet – three years before Google was even founded – libraries have been warned about the challenge to their future. Although many librarians have been innovative in various ways since then, it is fair to say that during those twenty years many players have been offering services that were once the exclusive function of libraries. For roughly $120 per year, a person could have access to a very large collection of books. It would be interesting to see what libraries could do if they had a similar amount of money to work with. But they don’t. 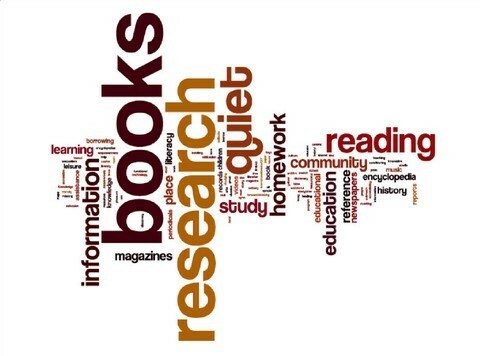 The most recent year in which national statistics were collected about public libraries is 2012. Earlier this year (2015), the US Government’s Institute of Museums and Library Services issued its final analysis of that data. IMLS noted that public library operating expenditures were $35.47 per person – and, of course, that’s for more than just offering e-books. Of course, libraries are not alone in facing change. All of us do. In addition to the Internet revolution we already deal with, there are several technology trends whose impact is only beginning — machine intelligence and analytics, a ubiquitous interface to the Internet and high-quality visual conversations that will finally enable the virtual world to replicate the trust, the serendipity and the nature of normal face-to-face human communications. These technology trends intertwine with and reinforce trends in the economy and society – the transition in employment to a post-industrial, digital economy where many people will earn their living providing knowledge-based services and intangible products; innovation as the competitive edge in the knowledge economy; the increase in the number of people who are both producers and consumers of content; the resulting requirement for cost-effective lifelong learning for adults. As with all change, while one part of your world is nibbled away, other opportunities open up. So it is with libraries. As part of the effort to disseminate the ideas in the report, I was asked to be the keynote speaker at the annual meeting of the New Hampshire Library Trustees Association last week. I then joined with Maureen Sullivan, former President of the American Library Association and long-time consultant in the field, to run two workshops for the trustees. The gist of my talk was straightforward. Libraries do not exist in isolation from the rest of the world. They need to be embedded in their communities, which means that they need to understand and respond to how their patrons’ lives are changing. Library leaders need to understand how each trend will have an impact on libraries. Libraries need to lay the foundation for where they need to be in the future. Not to put too fine a point on it, but continuing just doing a good job with things as they are now is insufficient and unsustainable. While the Aspen report notes the continuing importance of the library building, it is more for a future role than merely the warehousing of books. Moreover, successful libraries services can no longer be constrained by the walls of the library building. Every space in the community should be considered to be virtually part of the library. The library should be everywhere – physically and virtually. Librarians need to provide access and intelligent guidance not just to their local collection, but to a national, eventually international, and fluid combination of materials. 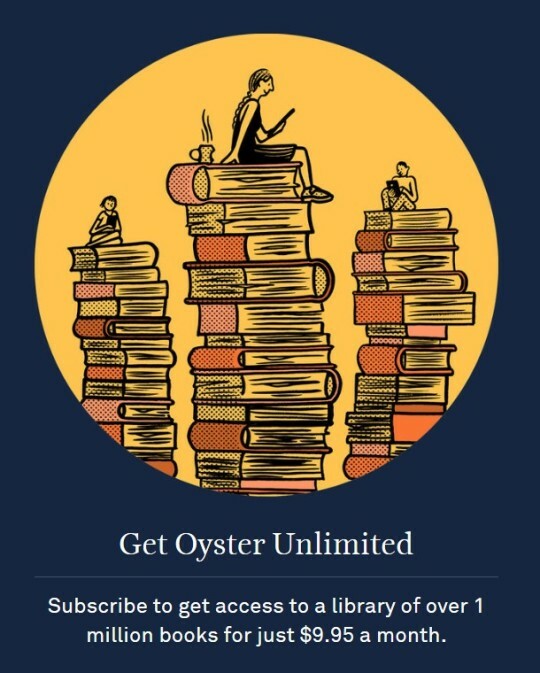 Indeed, the global digital network makes possible an emerging model of networked libraries that promotes economies of scale and broadens each library’s reach. Libraries can be the central institution of the knowledge/innovation economy, but to do so they must take the lead in helping their communities deal with the future so that both the libraries and their communities flourish. My last post was about the fight over intellectual property. A few weeks before that I wrote about what a book is in a digital age and suggested that librarians could become the equivalent of DJs for books. Pulling those two themes together, this post is about what some libraries are already doing that can shift the balance in book publishing. But, first a bit of history. When public libraries were first established well over a hundred years ago, one of their primary responsibilities was purchase books on behalf of their community. Then the community members could share all these books, without having to buy separate copies. Until the mid-20th Century, this worked in favor of publishers since libraries were, in general, their most reliable market for books. Libraries also helped build markets of readers that the publishers would sell to or that many people eventually bought the books they borrowed because they liked them so much. The library was a kind of try-and-buy location. As the industry grew, selling direct to an ever more educated public in the latter half of the 20th Century, many book publishers started thinking that libraries reduced their sales, rather than enhancing them. But that was a battle the publishers had lost long ago and couldn’t do much about. Moreover, it is a moot point in this century when e-books have overtaking traditional print book publishing. Even if that growth trend has slowed a bit recently, the battle between publishers and libraries has been renewed around e-books, not printed books. The traditional publishers – the Big 5 – have taken an especially restrictive approach to e-books, perhaps in the hopes of turning away from the historical role that public libraries have played for printed books. Until less than two years ago, some publishers even refused to sell e-books to libraries. 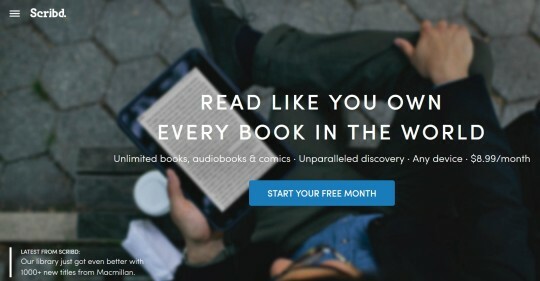 They still restrict the number of times an e-book could be lent or charge extraordinary prices for them. This pattern continues despite some good arguments that publishers could benefit from a more supportive relationship with libraries, as laid out by the marketing expert, David Vinjamuri. But any significant change, like e-books, can be a two-edged sword. They may be an opportunity for big publishers to change the rules. But they are also an opportunity for libraries. With this background, there has developed a movement among libraries to become the publishing platform for authors or to, at least, partner with self-publishing services. Although he lost by a little, one of the candidates in the election a few days ago for president of the American Library Association was Jamie LaRue, who has built his reputation in large part as a leader of the library publishing movement. There are already several interesting examples across the country. The Los Gatos Public Library has joined with the Smashwords self-publishing company. The Provincetown, Massachusetts library – proudly “Ranked #1 in the US by Library Journal” – has created its own self-publishing agency, Provincetown Press. Too often, news of new library services does not get widely publicized and is only seen by those already patronizing libraries. 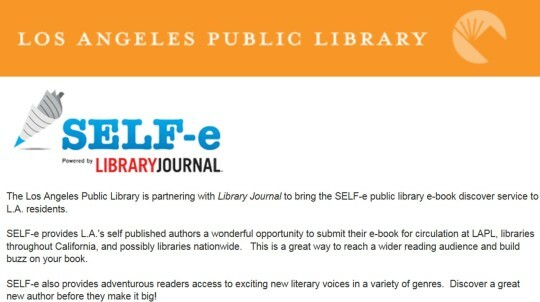 So it was helpful that LAPL’s platform for local authors was reported a couple of weeks ago in a publication they might well read – LA Weekly. With the Internet enabling easier collaboration and co-creation than ever before, as I’ve noted in this blog, we are also seeing examples of self-publishing that go beyond an individual author. Publishing by academic libraries and other non-traditional publishers is an increasing factor in research, as well. While it publishes papers that are peer-reviewed as in traditional journals, PLOS (Public Library of Science) is perhaps the best known adherent of “open access” publishing. Open Access means that there are no restrictions on the use of the articles, available online, free to read. Academic journals and books have been very expensive and not all of that cost can be eliminated by this new approach. For example, the peer review process still has to be managed. However, the cost is much lower. PLOS charges authors a relatively minimal fee. Rebecca Kennison of Columbia University Libraries and Lisa Norberg of the Barnard College Library have plans to extend the PLOS model, with a more cooperative funding arrangement, to “A Scalable and Sustainable Approach to Open Access Publishing and Archiving for Humanities and Social Sciences”. Overall, all of the initiatives that I’ve highlighted here are a part of a digital age trend in which we’ll see more librarians going beyond being mere collectors of big publishing companies’ books to being curators and creators of content. 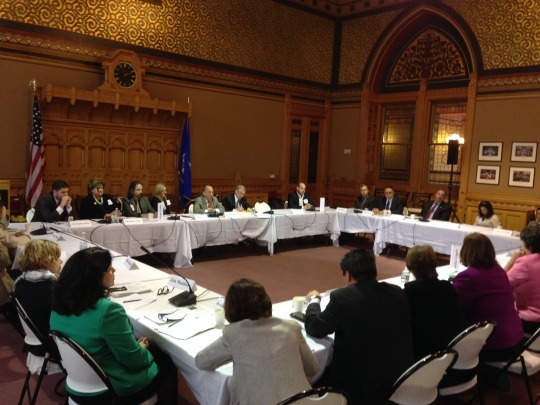 Yesterday, April 13, 2015, Aspen took the Dialogue on the road in a joint all-day meeting at the State Capitol in Connecticut, co-sponsored by the Connecticut State Library. It was the first such statewide dialogue about the future of libraries. It brought together more than 100 elected officials, policymakers, business executives, leaders of civic organizations and those involved professionally and as trustees in libraries. The diversity of participants was unusual – too often librarians just end up talking to themselves. 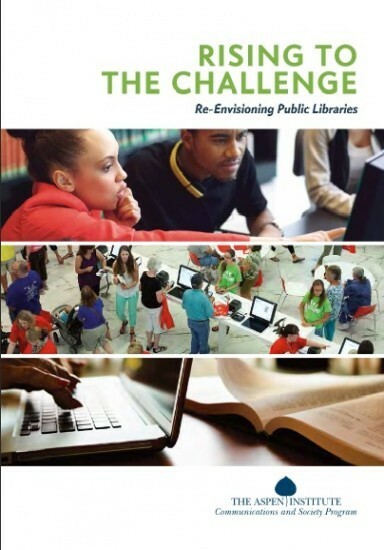 “To identify strategic opportunities presented by the state’s public libraries in response to the educational, economic, social and technological transformations that are affecting individuals and communities across Connecticut. “To explore how to leverage the assets of public libraries to build more knowledgeable, healthy and sustainable communities. Two themes caught my attention during the day. First, the necessity and value of library networks in a digital world. Second, the library as a community asset, in building the community that surrounds it and as a platform for people to achieve their economic potential. The former State Economic Development noted the role of libraries as something that will attract people to a community – in a situation where every community is competing for people. “With information at the fingertips of everyone wherever they are, the ground is changing under libraries. "Relevancy is a key issue for libraries. A future role for libraries has to involve more than those people already involved with libraries. In addition to the traditional role of being a place for 6 year olds, libraries are "where you go to get information [and training] and to change your life. It’s where you prepare for the next career you want or are forced to have. Creating a new role for libraries, in the face of stagnant or declining local funds, requires more collaboration. As an example, he pointed to Connecticut’s statewide purchases of e-books. Amy Garmer, director of the program, concluded by promising that Aspen plans to continue these statewide efforts, which will involve some of us from the working group. Maureen Sullivan, past President of the American Library Association, and I will be bringing these ideas next month to the New Hampshire Library Trustees annual meeting. 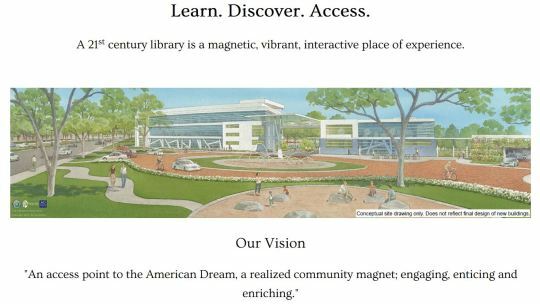 If you want to bring this vision of the 21st century library to your state or region, please contact one of us. A few days ago, I was in a meeting of library leaders watching a presentation about the current status of the Digital Public Library of America and the Empire State Digital Network. With all the work going on in libraries to digitize materials and also to manage materials that are born digital, someone asked what this means for the traditional role of librarians as collectors on behalf of their patrons. Someone else pointed out that librarians are beyond being collectors of materials to being curators. OK, but what does curation mean now and going forward into the future? In many ways, the deeper question is “what is a book” in the digital age? To provide some context, imagine all the books that have been written are each envisioned as a highway. Reading the traditional printed book of the pre-digital era was like getting on a highway and not getting off until it ends – unless, of course, you just stopped reading it at all. But when you’re reading a digital book, you might see something interesting from this highway – at any point – and get off for a look. You might return quickly or keep going further and further away from the highway (i.e., the original book you started reading). You might also want to follow a meandering path that someone else charted or “discovered” before you. So we are practically past the age when the book as a body of written material was siloed between hard covers and stood in isolation from other books. The book is no longer a discrete and fixed product. Some developments have already begun to recognize this change. For example, there are the “adaptive textbooks” from McGraw Hill Education and Harvard’s H20 Adaptable Digital Textbooks. In the new world of digital reading paths, how can the reader not get totally lost and confused? – Or perhaps get lost enough to discover new things for himself/herself. Better yet how can people be helped to discover new things and new connections that no one had discovered before, that we would all benefit from? How many of the people who have traditionally been trying to help readers – librarians, reviewers, editors, writers and others – are prepared to deal with the fact this is even a question they have to answer? With a new mindset about the role of a librarian and more of the kind of experimentation and technology Harvard has created and the rest of us will be better able to navigate the digital reading highways and byways. 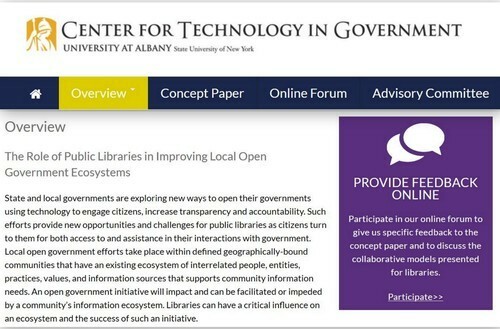 Last spring I wrote about my participation in a workshop on the role of libraries in open government, led by the Center for Technology in Government (CTG) at the University of Albany and funded by the Institute for Museums and Library Services. Last month, CTG released their final project report. You can get the report from their website, but I want to provide a summary here. As someone who has been involved in open government, public technology and libraries, the role of libraries seems obvious to me in at least three ways. First, libraries are places that almost everyone recognizes as neutral, objective and fair purveyors of information. The trust in this role of libraries is a valuable asset for any government leader who wants constituents to take seriously his/her pledges of openness. Second, librarians have the training and experience to help the average person make sense of vast volumes of information. And the open government initiatives around the US have certainly provided a vast amount of information. Just making this information available is a bit like trying to open a library by buying a million books and dumping them all into the middle of the floor. Without the assistance of librarians in these initiatives, the ideals of openness and transparency will not be achieved. Third, following on the previous point, librarians can do even more than help to organize and make accessible all of this new open government data. Librarians can also help train the average person to know how to make sense of the information. They can provide the space and the platform for citizens to collaborate on their use of open data. For example, John Szabo, the head of the Los Angeles Public Library, has provided a digital forum for people in south Los Angeles to use public land and building data as they consider and debate a major new development project in their neighborhood. Of course, while giving libraries a key role in open government initiatives can make those initiatives much more successful, library resources are limited. So it would be useful if part of the budget for open government be devoted to funding the role of librarians. “1. Clearly define the role of public libraries in community-focused open government activities. 2. Adopt a focus on the demand side of open government. 3. Adopt a community-wide perspective on open government. 4. Build capability to create and sustain new kinds of partnerships with a wider range of community actors. 5. 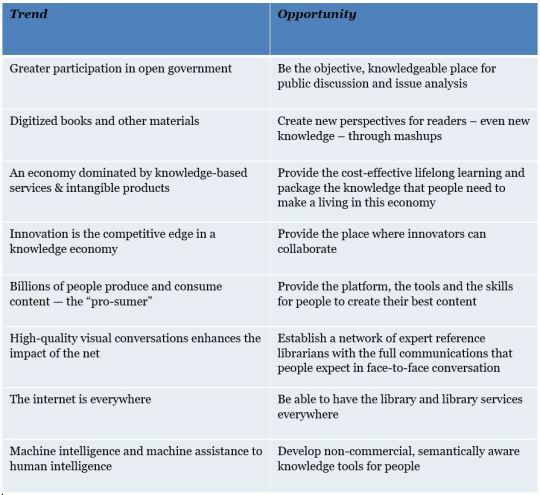 Build a knowledge base of public library open government initiatives. If you’re involved in government, open data/information, public sector transparency or libraries, it will be worth it for you to read CTG’s report for the rest of the story. Readers of this blog will not be surprised that I’m clearly in synch with the central foundation of the report that "public libraries [are] at the center of the digital age”, our era. The project was led by Amy Garmer of Aspen, who also wrote the report and who deserves enormous credit for this work. As Deborah Jacobs, Director of the Gates Foundation Global Library Initiative said, Amy Garmer is now the most influential non-librarian in the library world. In addition to these points, another strategic, but infrequently stated, point was made in the report – there needs to be a new model for sustainable funding for library services that recognizes and supports their fundamental role in our society and economy. Linda Johnson, CEO of the Brooklyn Public Library, said that we need to understand that libraries are not centers for books but for learning – and centers of enjoyment. Ralph Smith, SVP of the Casey Foundation and Managing Director of its Campaign For Grade Level Reading, said he had learned over time that libraries have a unique combination of “hi tech and hi touch” which is what is required for education these days. Although not directly related to this event, the Atlantic Magazine also had a recent article about the public library of Columbus, Ohio, titled “Not Your Mother’s Library”. What immediately stood out were two contrasting word clouds. First, the words people associated with past libraries, the libraries of their childhood. Aspen intends to follow up to implement and move the vision forward, so look for these ideas to take root in your city with your help. 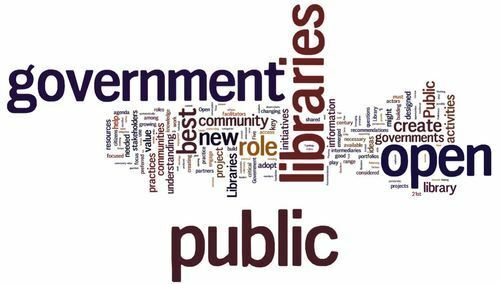 What Is The Role Of Libraries In Open Government? Earlier this month, I was invited to participate in a workgroup that focused on and merged two of my strongest interests – libraries and open government. This workgroup, made up of approximately two dozen leaders of the worlds of libraries, open government and the Internet, was pulled together by the Center for Technology in Government (CTG) of Albany University, as part of a project funded by the Federal Government’s Institute of Museums and Library Services (IMLS). The CTG staff will summarize the day and a half of intensive work at a later point. But I thought I’d share some of my observations from participating in it. First, while open government, particularly the open data initiatives that have occurred all over the US and elsewhere, is clearly a step forward for transparency, it is not always very useful to the average citizen. That’s why too often, the data has been used mostly for “gotcha” articles by local news media. Typically, the data is put out on the web. This is akin to setting up a library by buying 10,000 books and dropping them all in a big pile in the middle of the floor. Librarians have long developed skills in organizing knowledge and, as reference guides, in helping people find what they need. So the most obvious first role of librarians is to help open data initiatives succeed by applying their professional skills to the data. Second, libraries can be the place where open government occurs. This role not only involves making available to citizens the printed and online forms they need to interact with government – or even extending that to enable citizens to have video conversations with government staff who are located many miles away from home. Libraries can also encourage the discussion of public issues. Traditionally, libraries have used their meeting spaces for open forums. More recently and much more interesting is the role the Los Angeles Public Library has played in a community in south Los Angeles. The local library branch there is hosting Betaville, open source software to enable people to collaborate together to propose urban design solutions for their community. Betaville is being used for people to do exactly that with respect to a large proposed redevelopment of the Rancho Cienega facility. The library was the only place where people could come together to do this work, which had the proper technology and also the trust of residents that it is an objective, open facility. Third, Jamie LaRue, former director of the Douglas County library system, which has been a pioneer in libraries as creators of content, built on that experience to propose an additional role for libraries. In the face of the demise of many local news outlets, he suggested that this creative role of libraries be extended to becoming the platform for local news. Finally, while a number of state and local governments have encouraged their local software developers to create apps using open government data, this is clearly not enough. There are many apps that are needed, but make no sense for private companies that ultimately require profits. Government cannot abdicate its own technology role. Recognizing that it can’t do everything, however, government can call on librarians to understand what gaps exist based on what they are asked for by library patrons. For more information, see CTG’s website at http://www.ctg.albany.edu/projects/imls . They have also posted a concept paper at http://imls.ctg.albany.edu/book/enabling-open-government-all-planning-framework-public-libraries . If you’d like to participate in the discussion about libraries and open government, you can do that at http://imls.ctg.albany.edu/forums/online-discussion-concept-paper . 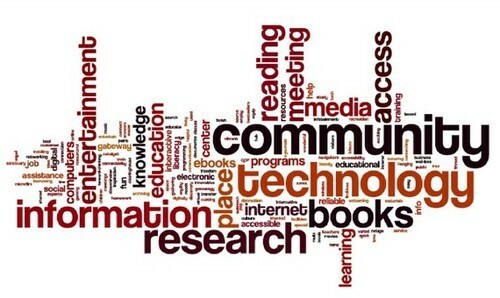 How Can Libraries Respond To Technology Trends? On May 3, the Library Trustee Association of New York State held its annual trustee institute. I ran a session on the intersection of technology trends and changes in libraries. I made a presentation, titled “Creating The Library’s Future”, to get people to start thinking about this intersection. Then I shifted to thinking about libraries in this future world. I noted the warnings have been around for a long time, with a quote about the Internet’s impact almost twenty years ago. I asked about a series of websites that seem to offer services which librarians have defined as their role. All of this requires librarians to enhance that role to keep ahead of what are now commodity services and to think about library services as pervasive throughout the community – not confined to what goes on in the library building or even what is local. How will technology change the expectations of patrons? How could/should future technology trends affect the way individual libraries budget and spend their money? Expectations of patrons are rising because of what they exposed to, outside the library – at work and at home. Budgets need to shift, setting a minimum percentage for digital collections and providing staff training. As library activities become more varied, there may need to be more private spaces for music, videoconferencing, etc. The availability of resources directly from the Internet is upsetting the traditional hierarchy of the library world. So individual libraries may see alternatives to the cooperative systems or the State librarians that used to be the primary suppliers of technology. Moving To A National Digital Library? In a post last year, http://njacknis.tumblr.com/post/66967472797/a-national-future-for-libraries , I discussed the increasing volume of digital text, video and audio, produced by millions more writers and artists than have been supported by the big publishing and media corporations in the past. These trends have important implications for libraries, especially the need to offer library patrons a national collection and reference to materials located anywhere. That’s why I titled the post “A National Future For Libraries”. So it was great that the US Government’s Institute of Museums and Library Services (IMLS) conducted their “Strategic Priorities 2014” conference with a focus on a National Digital Platform. The meeting, held at the main building of the New York Public Library on Tuesday this week, featured most of the key leaders in the world of libraries and other non-profit cultural and information organizations as you can see below. It was very encouraging to see these leaders working together with a generally positive frame of mind, trying to figure out how to create and, more important, sustain a national digital library. There’s clearly lots of work ahead of us – including much more than the usual community of librarians – but this was a good start. You can see the conference video at http://www.tvworldwide.com/events/imls/140429/. Since it was a whole day event, I’ve put the agenda below so you can watch particular sections. A National Future For Libraries? The second and final meeting of the Aspen Institute workgroup on the future of libraries was held last week. The question that kept crossing my mind is simple: given the obvious trends in the library world and, more broadly, the world of knowledge, is some form of national network of library services inevitable? When books were physical items primarily produced by established book publishers, the local library was the place local residents needed to go to get access to those books (assuming they couldn’t afford to buy everything they wanted to read). There are still many printed books in local libraries around the country. We are, after all, in a transitional period and we can expect to see some printed books lasting long after almost everyone will be reading digitally – 2050? But books are changing. It’s not just that there are digital versions of printed books. Self-published books and co-created texts already are more numerous than traditionally published books, even including e-books. With so much digital content, produced by so many different sources, the purely local collections in a local library can easily be outmatched in both quantity and quality. The Digital Public Library of America is one important response to this accelerating condition. 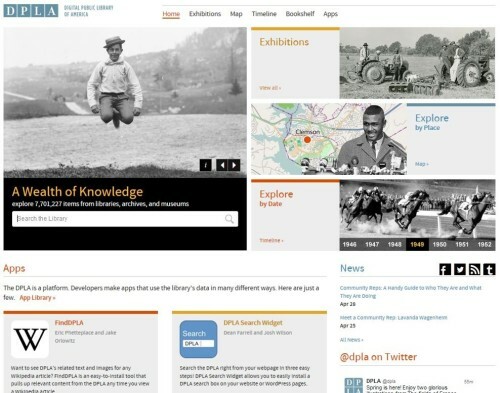 Indeed, DPLA is as much the future of libraries as anything on the horizon right now. DPLA doesn’t centralize all of the digital collections, but it makes them available to everyone. It uses local library resources (and regional consortia) to collect and organize digital content created locally, but it lets that content escape the constraints of the physical building in which they have been stored. 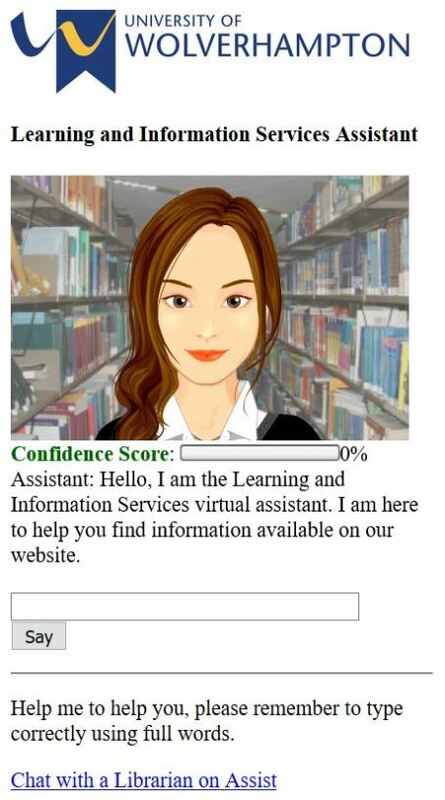 Another sign of the times is the use of virtual reference librarians. These were first established to share the load of patron requests especially at odd hours. However, the potential of a network of reference librarians is much greater than that. Consider the deep knowledge that a reference librarian in one part of the country can have about some subject – say Hellenic pottery as an example. Why shouldn’t she or he get the reference questions that come up about that subject no matter where the patron is? Can the reference desk in the local library match this knowledge? Of course not. Is it possible that the reference librarian locally happens to be that expert in a subject? Of course. Why not let her specialize? In a future world where most content will be digital, a national network of reference librarians would provide patrons with the best possible service and pointers to the best places to find the content they are searching for. DPLA and specialized virtual reference librarians are just two significant ways that library services are no longer limited to the local library building. So, if not as the collector of printed books or the location for an all knowing reference librarian sitting at a desk there, what will be the purpose of local library buildings in the decades ahead? Already we see the library building being used as a meeting place. Even more exciting, many libraries are becoming centers for create content and culture in various ways – offering Maker Spaces (with 3D printers), poetry rooms, video/audio studios, etc. Consider also that the national digital collection that is being pioneered by DPLA will need much more manpower to become useful than DPLA and its hubs can provide. The local library building can be one place where the staff can help with the task of tagging/classifying and otherwise making sense of all the new content produced by others. The local library can also be the outreach center to get volunteers to help with this enormous task and thus be the local chapters of a national pool of librarians and colleagues. As with any other sea change, the shift to a national library network will not come without strife. The most obvious trouble is that libraries have been inherently local institutions supported by local taxes. There is currently a very small amount of Federal money devoted to library services, mostly in the form of a fraction of the e-rate program. As library services become not merely local, but an interstate concern, the Federal government or some other national organization is going to have to step up funding for the national institutions that will make those services work. The Aspen Institute has also been involved in projects about citizenship so it worth remembering that our founding fathers strongly supported libraries as the cornerstone of an educated citizenry, which they thought, in turn, was essential for democratic government to survive. Our national leaders today don’t explicitly share that understanding and seem to find it easier to deal with a less engaged citizenry. Perhaps the nationalization of libraries will make it easier for American citizens all over the country to gain the knowledge necessary to play their proper role in our democracy and thereby improve the way that our national government functions. Now there’s a long term goal! Last month, the Aspen Institute gathered about two dozen leaders and innovators to a workshop on the future of public libraries. I was honored to be asked to participate. I will be helping to develop the larger strategy, but I thought I’d share some immediate observations from the discussions and my reflections on them. As a pre-condition to thinking clearly about the future of libraries, we need to leave behind legacy thinking. The libraries of today cannot be and shouldn’t be the libraries that we fondly remember from our childhood. A library is no longer a building merely with books. Even the addition of e-books to printed books is not a fundamental and sufficient change in the traditional library model. To escape that old mold, library services can now – and should now – escape the confines of the library building itself. With the Internet, library services can be everywhere. The reaction of some people was a feeling that the “little free library” movement built cute little boxes but it is sad that library funding has been so diminished that we are left with such pitiful collections. My reaction was a bit different. I said I agreed that this little box was limited, if what you had in it was printed books. 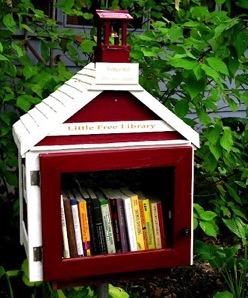 But why not take all the outdoors and other locations which are targeted for “little free libraries” and make the real and much bigger digital library available to people there. As a portal to the digital library online, the collection can be as large as possible even in this little box. I also pointed out that our economy has been changing and more people earn a living in digital ways, based on knowledge and innovation. In such an economy, you would think that libraries should be the key institution and hub of society. I gave examples of how some libraries are providing support to entrepreneurs. Another implication of this role for libraries is that the distinctions between public libraries and those labeled as specialized, school or university libraries will be weakening because often an entrepreneur or other innovator needs access to specialized technical knowledge as well as general audience information. It was clear that the idea that Google and the Internet make librarians unnecessary was weighing on the minds in the room, as elsewhere in the library world. Maybe it’s because I’ve been an unusually long time user of the Internet, but I’m waiting for help from good librarians. What most of us face is TMI and TLK – too much information and too little knowledge. Librarians can be the guide, curator, re-mixer, and knowledge creator for people who are drowning in a sea of information, or worse, swimming in the wrong part of the sea considering what they need to know. Of course, it was clear from the discussion that many of us realize the users of libraries can also contribute, as in the pro-sumer model where a person is both consumer and producer of information. So librarians should encourage and make space for people to self-publish. Going beyond text, libraries should do the same for people making videos, music or even things (through the availability of maker rooms and the like). Along those lines, there was a bit of discussion about the Douglas County (Colorado) Library model. That library got fed up with the refusal of four major publishers to sell e-books to them and the tough conditions imposed by the other two big publishers. So it reached out to many independent publishers to get their e-books in the library. A much wider possibility in the future is for the libraries to help authors to publish their works without the traditional publishers. Yes, I know there could be a lot of junk published, but there is no reason why book reviews, peer reviews, and other means couldn’t be used to help identify the junk without the need for editorial approval from the big six publishing companies. The Public Library of Science (PLOS) has, as an example, established itself as a respectable medium for research using these techniques. Finally, it seems that each library is trying to create the future itself. Why can’t librarians and others in the library world work together nationally, enabled by the tools of the Internet. If there is a librarian in Seattle who is an expert on Eritrea, why can’t she be available all over the US? Someone described this as the library version of MOOCs. This kind of federation, perhaps mutual aid pact, is a natural result when librarians realize their services are no longer limited to library buildings. What Is A 21st Century Library For? Although I’m not a librarian, I am the President of the Metropolitan New York Library Council (metro.org) and former President of the New York State Library Trustees Association, among other library positions. Because of this long standing activity in the library world, which seems to some to be incongruous for a technologist, I’ve often been asked what libraries will be like in a world of Google searches, e-books and the like. Although some people question whether we will still need libraries, those folks haven’t been in libraries recently. Most libraries have had significantly increased use over the last decade, both in the building and online, both for printed and e-books and databases. Libraries also continue to be the major public institution that helps to overcome the digital divide. See the recent Pew studies on this subject. So I’m not going to spend time here retreading the issue of the existence of libraries or even printed books. Instead, I want to talk about the longer term, more subtle ways that libraries will evolve along with the rest of the 21st century world. First, look inside the library building itself. Most newly renovated or newly built libraries have devote a decreasing percentage of their space to bookshelves. There are computers everywhere and meeting room for community groups, book clubs, author presentations and the like. In the future, there will be much more than the community center rooms found in most libraries today. There will creative centers for writing, poetry, music and even community art. The public library in Aarhus, Denmark has been one of the world leaders in creating these new kinds of library spaces. In addition, libraries are beginning to understand their key role in supporting entrepreneurs as unofficial corporate librarian for these budding businesses. The Chattanooga Public Library has made their top floor of their main building a center for entrepreneurs. The public library in Westport, Connecticut opened up a Maker space in which people can use 3D printing machines to make all sort of artistic and/or utilitarian objects. Clearly, e-books are increasing in popularity and most libraries offer e-books for loan. Some even offer e-readers for those who don’t have one. The serious longer term issue is that some major publishers are refusing to sell e-books to libraries, even under onerous terms such as elimination of the e-book after it has been used a few times. This is a major threat to what libraries have been all about for a long time – a common collection of books. I hope the lawyers figure this out soon because if the situation continues it will prevent libraries from evolving their traditional role as collectors of shared books. It’s worth noting that traditionally published books – print or electronic – are becoming a diminishing fraction of the total written material. Traditional publishing is being dwarfed by self-publishing and peer reviewed open source publishing on the web. So one new responsibility of librarians is to include these new sources into the library’s collection, manage them and make them useful to readers. Moreover, the publishers who are shunning libraries may find they will be encouraging librarians to undertake a more frightening path – mashups of parts of electronic texts. In various ways, librarians have always been curators. 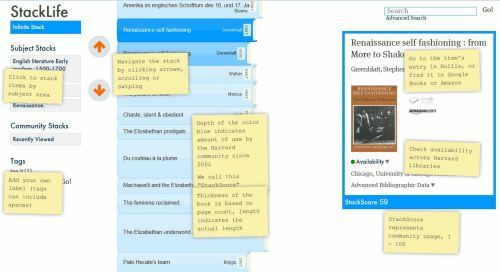 Now they can curate parts of open source writing and assemble them in new works that help readers better understand a subject than any single author can. But the most important trend to note is that library services will be everywhere. They will no longer be constrained by the limits of the building we call a library. In a sense, librarians will reference guides to the Internet, including the many parts that are not visible to Google and other search engines. Library services will, as always, help organize the world’s knowledge for us and help us find what we need – but these services will be accessible from anywhere. I’ve only skimmed the surface here and this post is already too long 😉 So let me know if you want more.